[CLOSED] GET A ROUND IN! 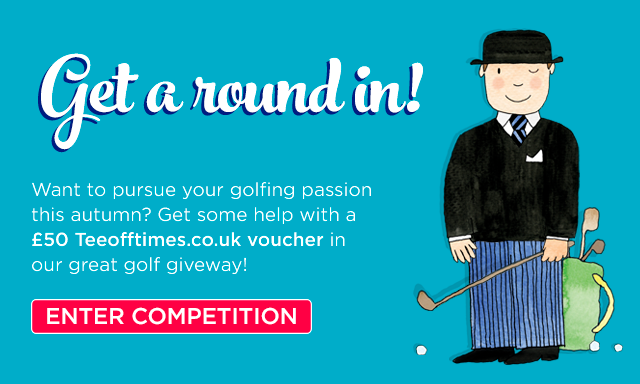 Win a £50 Teeofftimes.co.uk voucher! Autumn may be here but that doesn’t stop those with a passion for golf getting out and embarking on an 18-hole adventure! In fact, it can be one of the best seasons in the year to play a round. The weather isn’t too hot but the cold hasn’t set in yet, the courses are less busy and it can be a memorable game amongst the russet and gold of the autumn leaves. With the drop in attendance of so-called fair-weather golfers, many courses will drop their green fees or offer special deals and discounts. This may give you the opportunity to play a course you might never have thought possible, like recent The Open hosts Royal Birkdale or the inimitable and challenging Celtic Manor in South Wales. At The Insurance Emporium, we love a golfing adventure and we love to help people find their own too. That’s why we’re offering the chance to win a £50 Teeofftimes.co.uk voucher in our latest Get A Round In! golf competition! Maybe you want to go and perfect your swing on a course played by the legends or perhaps you want to take your clubs to a part of the country you’ve never visited before. Either way, this super prize gives you the opportunity to get a round in at the course of your choosing! Since it was established in 2007, Teeofftimes.co.uk has become the most popular way to book a round of golf in the UK & Ireland. With over 1,700 clubs on their books, the chances are you’ll be able to tee off at a golf club that really suits you. To use your Get A Round In! £50 prize, all you’ll have to do is sign-up to the website, completely free of charge, and enter in the code of the e-voucher at the checkout section. It’s that simple, before you know it, you’ll be dancing up the fairway like Dustin!